Good job evading the question Daylla meant to ask, Cass! Good thing Daylla doesn’t shoot plasma bolts. I was gonna ask why she bluescreened over Hiroshi knowing who she is, with that kind of lineage. Then i remembered that there are many celebrities that geek out over other celebrities. 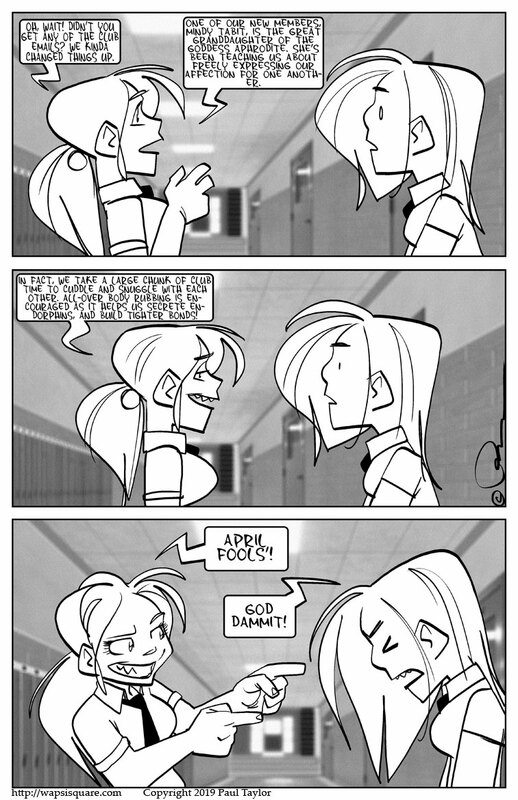 …and Mindy is just around the corner for this convo, overhears, thinks it’s actually a GREAT idea, and school is never the same again! And even if she wasn’t, given the presence of a young relative of Poseidon, it’s plausible enough for an April Fooling. Or non-April Fooling. I can’t help but think of k-pop music idol group Mamamoo, whose leader, Solar, is affectionately known as “yeba” (short for “yeppeun babo” or “pretty fool”) because while pretty sharp on the business side of things, she can be a little gullible socially. She’d have fallen for the same story. Which also raises the implication that Aphrodite is still…ahem, actively engaged…with the human race (and/or others) since at least the past couple of generations. That may or may not give some hope for nerds & basement geeks everywhere that they may someday lose their virginity. I just love Daylla’ s completely dumbstruck expression! Well, that sorta pays Daylla back for some of the chain-pulling she did about Hiroshi. I get the feeling there will be a lot more chain-pulling in the days to come. Then Mindy Tabit *isn’t* Aphrodite’s great-granddaughter? The best pranks have SOME truth to tie them to reality. It makes things seem more plausible. All deniers getting kidnapped, bound and pushed from the edge of the hollow earth disc. Then they splat on mars, thats why mars is red, of course. Well, it was a day early, but really worth it! Maybe I missed it. Was it ever established which one was which? I just assumed Mindy was the taller one – no idea why…. Ahah! Thanks. That somehow makes Castela’s description of recent club activities funnier. F-i-n-a-l-l-y! I can dispense with calling them the Tall One, and the Chubby One. I always felt that was a little rude. Thank You! That explains the eyes, too. B0mar: I’m six feet tall. When i was stationed in Sicily in the Navy, back in 1971, my best friend was named Mike.Our friends called him “Big Mike” and me “Little Mike”. Remember the joke about the farmer who had two horses he couldn’t tell apart, and then someone suggested he measure them? And he found out the black horse was four inches taller than the white horse? Of course, Scots singer/comic/banjo player Billy Connolly is know as “the Big Yin”. When he was younger, he and his father – also named William – worked in the same shipyard. Billy grew to be significantly taller than his father. A good prank should confuse, not abuse. This is a good prank. What I wonder is this: was Castela just giving Daylla a hard time… just “funnin’ with a friend”? Or, was she actually trying to avoid talking with Daylla about her new relationship with Shawna? Pickle has a history of being reluctant to let her friends know, when she’s attracted to someone… and both Daylla and Scarlet have chewed her out for that. Is she doing the same thing again? Why do they call it “common sense” when it’s so bloody UNcommon? And don’t forget to save the Naugas! “Common sense” is usually neither. Absolutely — many years ago, in a small area not so far away from here, there were vast herds of Nauga that roamed the town of Naugatuck (Connecticut). Alas, they found that the tanned skin of the Nauga was very useful for covering furniture, leading to the herds being decimated at a local processing plant, that created Naugahyde covered chairs and sofas for many years. Alas, there are not many Nauga left in their native breeding ground, as the town has grown in population and their free range area has shrunk. So sad. And the evil nauga ranchers’ habit of forcing the poor naugas to drink potentially deadly hydric oxide didn’t help.